Verlander could be a difference maker in the World Series. Photo via sporting News. Lets do a quick glance at the World Series pitching matchups and see how they may drive a prediction. I was pretty close on LCS predictions (I got LA in 5 and predicted Houston in 6). Lets see how we do for the World Series. Despite the seven game ALCS series, it looks like Houston is keeping their rotation in tact. Nonetheless, they’re going to be at a disadvantage compared to the Dodgers, who have been resting for days. Here’s how I think the matchups will go: the Dodgers have announced their four rotation guys but the Houston #3-#4 are guesses. The Astros and Dodgers are literally the two best offenses in baseball this year by fWAR added, so it shouldn’t surprise anyone to see some offense this series. The Astros take a slight hit versus lefties … but not as much as the Dodgers do. Meanwhile the Astros led the league in BA versus righties and have plenty of experience hitting against the Dodger’s one RH starter (Darvish) by virtue of him being in their division for years. So some interesting matchups await. Game 1: Hou@LA: Keuchel vs Kershaw: ace versus ace; both are going on regular rest. Kershaw has been decent this post-season, counter to his career post-season record of unluckiness. Hard to predict anything but a game 1 win for the Dodgers at home though. 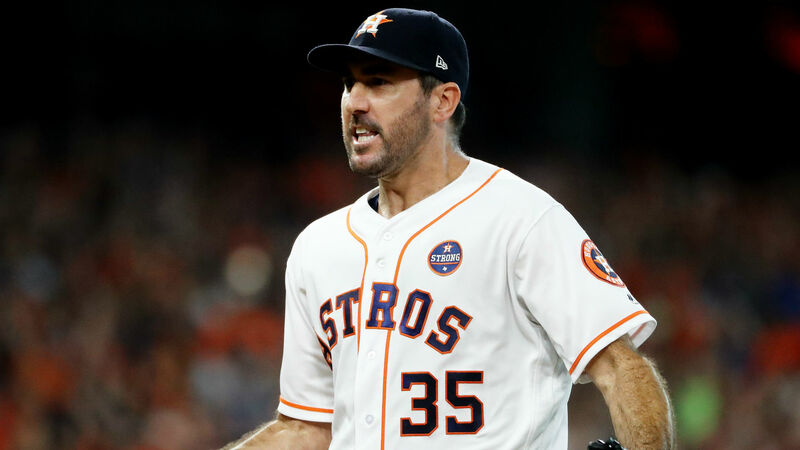 Game 2: Hou@LA: Verlander vs Hill: Verlander has been great since moving over to Houston and has been unstoppable in the post-season. Hill is no slouch himself but Verlander won’t be denied. Game 3: LA@Hou: Darvish vs Morton: Morton seems to be the weak link in the Houston rotation; he may be replaced by former Nat Brad Peacock. But as noted, the Astros will not be afraid of Darvish and have yet to lose at home. I see a Houston win here. Predictions: I see a split in LA, and I see Houston taking games 3 and 4 in Houston. So Kershaw is on the mound in game 5 in a do-or-die situation; he gets the series back to LA but Verlander shuts the door again. In a move that surprised me, the Nats announced mid friday 10/20/17 that Dusty Baker would not be renewed. I’m guessing that also goes for his whole staff. I think he did an excellent job with the team this year, given the ridiculous number of injuries the team faced. He clearly stabilized the clubhouse post Matt Williams. The knock on him prior to his Nats career was handling of pitchers, over-use of relievers, and a general lack of modern baseball strategy. But his tenure here has seen none of these issues; there’s quibbles about starter over-use earlier in the year, but that was more about his decrepit bullpen than him riding his arms too heavily. The team shifts and plays modern baseball; I see no evidence that he’s a Mike Scoscia-level old-school hard head. So I’m not exactly sure why they felt the need to move on. I don’t think you can pin the playoff loss on Baker either; when your team hits .186 and loses two games where the starter threw 6-no hit innings … its tough to win. Some people keep mentioning his sticking with Jayson Werth instead of Howie Kendrick … or his lineup construction choices batting Werth 2nd (nevermind that lineup construction theory has been proven to be practically negligible over an entire season). I’m not sure I agreed with the quick hook of Scherzer in his start, much like I hated the quick hook of Scherzer in game 5 of 2016’s NLDS. But otherwise, its hard to blame the manager for this playoff loss. I mean, if Jose Lobaton‘s foot doesn’t come off the bag, do the Nats rally and win game 5 and we’re still playing playoff baseball right now? 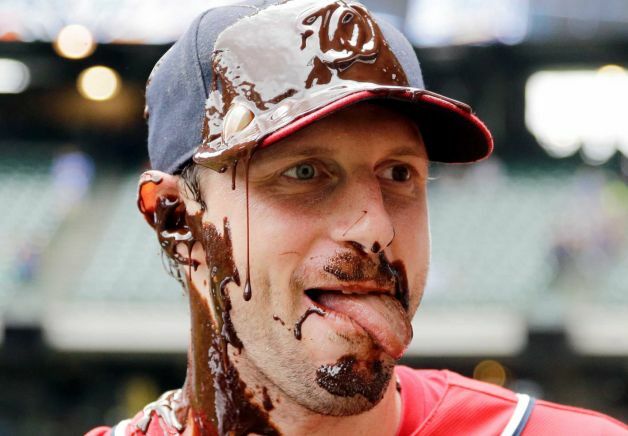 If the ridiculous 5th inning sequence of events doesn’t befell Scherzer’s outing … are we having a different conversation? in 2009, He inherited Manny Acta and an awful team and whacked him mid-season. Fair enough. He elevated then-bench coach players’ manager Jim Riggleman to the job and let him lead a mediocre to bad team for another year and a half. In 2011, when Riggleman finally had the team playing .500 ball, by all accounts Rizzo refused to even take a meeting with him to discuss his job status, leading to Riggleman’s resignation (my take on it here from the time). He then appoints the guy he apparently wanted all along in Davey Johnson … who led the team to a .500 record the rest of the way, just as Riggleman was doing. The team improves 18 games in 2012, but then slumps and misses the playoffs in 2013, at which point Johnson gets whacked. Rizzo brings in his old Arizona buddy Matt Williams, who catches the team as it recovers from its injury issues and leads them to the 2014 playoffs, where he badly over-manages and the team loses in four. By the end of 2015, the clubhouse is in absolute disarray, as documented by WP beat writer Barry Svrluga here: Part 1, Part 2, Part 3. There’s some amazing information here, and its no shock that the team not only missed the playoffs but whacked Williams soon after the season was over. The team then had the embarrassing interlude with Bud Black. then they hired on Dusty Baker and tried to save-face with the Black situation, saying Baker was their choice all along. And now they’ve whacked Baker after a season where he’s possibly in line to be Manager of the year. That’s 5 full time managers in 8 seasons at the helm. Does this sound like a good strategy to you? Look at some of the better teams out there; they’re not cycling through managers every two seasons. Since our season is over (but the hot-stove has not yet kicked in), i’ll piggy back on the recent posts to this same topic done by Mark Zuckerman at MASN and by Chelsea Janes at WP. Their posts both touched on some of the same issues; i’ll take those issues and add in a few of my own. 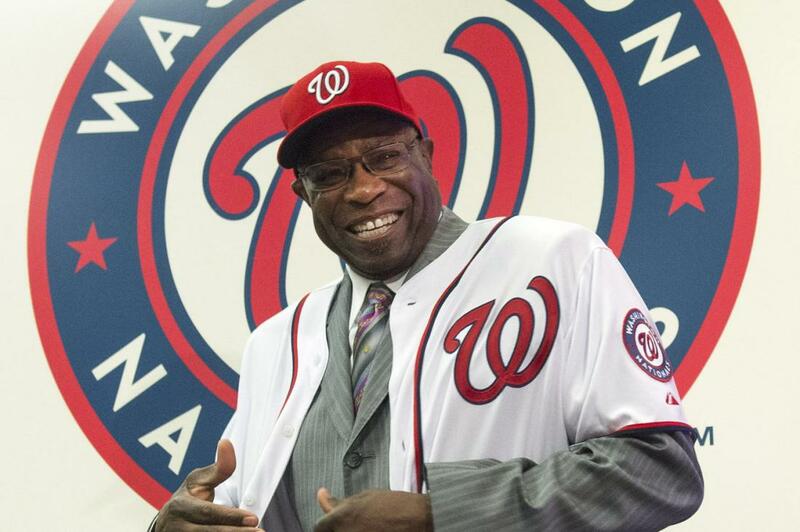 Resolve Dusty Baker situation. Many reports have noted that the team wants him back and that he wants to return. I see little that he could have done differently in the 5-game NLDS loss to use as evidence that he’s not the right guy (you can’t lose when your pitchers throw 6 no-hit innings in playoff starts), and he’s so clearly a better man-manager than his predecessor Matt Williams that I see no reason not to extend him. I know that the Lerner’s don’t like to do long term contracts, and lets just hope they offer Baker the raise he deserves for two straight division titles (and, in my opinion, the NL Manager of the Year in 2017 award that he should get for working around so many injuries this year). Should we bring back Jayson Werth? Yes he’s the “club house leader,” yes he’s been here for seven years and has settled in the DC area. But he struggled this year with both injuries and performance, is entering his age 39 year, posted a negative bWAR in 2017, and the team has a surplus of outfielders who are probably MLB “starters” heading into 2018, more than we can even field. I think the team says to Werth something along the lines of the following: Go see if you can find a DH/part time OF job in the AL for a couple years until you’re done playing and then we’ll hire you back as a special assistant/hitting instructor/bench coach or something. I’m not entirely convinced that Werth is a DC lifer though; he’s been kind of a nomad in his career. Drafted by Baltimore, traded to Toronto (with whom he debuted), traded to the Los Angeles Dodgers, signed as a FA with Philly for four years, then with us for seven. Yes he’s been with us the longest, but this isn’t a situation like Ryan Zimmerman where we’re the only org he’s known. I think he heads off to the AL for a couple years then comes back to the fold with a front office job. What do we do at Catcher? I’ll quickly repeat what we’ve been discussing in the comments of previous posts; yes I know Matt Wieters struggled badly at the plate this year, yes I know he botched the 5th inning of that fateful game 5. But he’s not going to decline a $10M offer after this season, nor is the team going to swallow that amount of money. Prepare yourselves for another season of Wieters, who we can only hope bounces back in his “contract year” and gets a bump in performance. Meanwhile, as much as we love the Jose Lobaton cheerleader routine, we do need more production from the backup. Even though Lobaton got just 158 ABs this year, he still managed to put up a -1.0 bWAR figure. That’s hard to do. If only we could just have him only play for us in the playoffs … (big hit in game 5 in 2017, the clutch 3-run homer in 2016). I suspect the team will go with Wieters and Pedro Severino as his backup, getting Severino at least two starts a week to get him up to speed on MLB pitching, then making a 2019 decision based on whether Severino looks like he could hit enough to be a full time starter or if he remains the backup to some FA acquisition. We have others in the pipeline who may prove themselves worthy soon (Raudy Read in AAA, Taylor Gushue in AA, Jakson Reetz in High-A, Tres Barrera in Low-A, plus long-serving minor leaguers Spencer Kieboom and Jhonatan Solano in the AAA fold who may or may not come back for 2018). Harper: lets face it, there’s NO WAY he’s not hitting free agency. Scott Boras client with a chance to set the all time contract record? Both guys have the ego required to pursue that avenue. And yes, while some Boras clients (Stephen Strasburg) have taken pre-FA deals, very few do. You hire Boras generally to get the biggest value deal and to leverage his relationships with owners so as to negotiate directly with them and that’s what Harper will do. Rendon: he’s still got two arb years: what I think the team will do is do a 2-year deal to buy out the Arb years and get cost containment. MLBtraderumors projected Rendon’s arb salary for 2018 at $11.5M and they’re usually pretty accurate; I could see the nats offering Rendon a 2yr/$26M deal for $10M in 2018 then $16M in 2019 or something like that … maybe a little higher in his final year given his MVP-calibre season. That’d be good for the team because Rendon might be a $20M/year player, and good for Rendon b/c he’s injury prone. Past this though … Rendon is also a Boras client but he projects to me kind of like Strasburg in that he’s low-key and may want to commit to DC longer term. Of course, Rendon is also a Houston lifer (born, high school and college there) so he could also want a return trip home to play for his home town team. Probably an issue for the 2020 hot-stove season. Murphy: the Nats have gotten such a huge bargain with the Murphy signing. He’ll only be 34 at the beginning of his next deal, and he plays a position (2B) that isn’t nearly as taxing as an OF or other infield position. I would feel completely comfortable offering him another 3 year deal, increasing the dollars to maybe $16M/year (3yrs/$48M). Do they need to pursue a Starting Pitcher? Absolutely, 100% yes. Joe Ross is out for basically the whole of 2018, they traded away all their AAA depth last off-season, and the guys remaining in AAA (A.J. Cole and Erick Fedde) did not grab the 5th starter job like they had the chance to in 2017. Edwin Jackson probably earned himself a shot elsewhere but was too inconsistent for my tastes. I think the team splurges here, trying to get the best additional veteran starter they can find either on the free market or in trade. The market for starters is intriguing: Yu Darvish, Jake Arrieta are Cy-Young quality arms available. There’s some decent SPs like Masahiro Tanaka and Johnny Cueto who can opt out but who also may just stay put. There’s #4 starter types like Lance Lynn and Jeremy Hellickson who are available and could be good 5th starters for us. There’s guys who have put up good seasons but have struggled lately (Jaime Garcia, Francisco Liriano, Clay Buchholz) who could be intriguing. So it’ll be interesting to see who they get. What is the Nats 2018 outfield? Do they stick with Internal options or do they hit the FA/trade Markets? I like a potential 2018 outfield of Taylor/Eaton/Harper. I like Taylor in CF providing better defense than Eaton right now, given that ACL injuries really are 2-year recoveries. Given Taylor’s big 2017 and his “Michael A Tater” NLDS, he’s more than earned a starting spot in 2018. That leaves some surplus in the OF for 2018 … something we’ll talk about next. There are some intriguing names out there on the FA market (J.D. Martinez, Justin Upton, Lorenzo Cain) who could slot into either LF or CF as needed and give a hopeful boost to the offense … but are any of those guys and their 8-figure salaries guarantees to be better than the cost-contained Taylor? I don’t think so, and that’s why I think we stick with him. Do the Nats leverage their sudden depth of position players in trade this off-season? In particular, i’m talking about Wilmer Difo and Brian Goodwin, both of whom played extremely well when given the opportunity and who both proved that they’re MLB starting quality. If we stick with Taylor as a starter, then you have both Goodwin and Andrew Stevenson as able backups and that’s one too many. If we (going back to the previous point) buy another outfielder, then that’s even more surplus. I’m of the opinion that the team needs to sell high on both Difo and Goodwin and acquire needed assets (5th starter, bullpen help, near-to-the-majors pitching prospects). What do we do with the bench? Drew, Lobaton, Kendrick, de Aza, Raburn all FAs, Lind has a player option but may want to try to parlay his excellent PH season into a FTE job. So that leaves … not much. We need a RH bench bat who can play corners (1B/LF): that was Chris Heisey to start the year .. but he’s long gone. Kendrick ably filled this role … but he won’t sign back on as a utility guy given his excellent 2017. If Lind doesn’t exercise his $5M player option, we’ll need a big bopper lefty on the bench again. We do have a guy like this on the farm and on our 40-man (Jose Marmolejos) but is he MLB ready? He had a nice AA season, but AA to the majors is a jump. If we flip Difo, we’ll need a backup middle infielder. Do we keep him assuming that Turner/Murphy will get hit with injuries (as they both are apt to do?) Turner missed months, Murphy missed nearly 20 games in each of the past two years; is that enough to keep someone around versus flipping them? We do seem OK with backup outfielders right now, assuming that Andrew Stevenson is sufficient as a 4th OF/CF-capable defensive replacement/pinch runner type. So, that’s potentially a brand new bench. Luckily its not too hard to find veteran big-hitting RH or LH bats; we seem to do this every year and have some luck. Middle infielders? Would you sign up for another year of Drew? I don’t think I would at this point; he just seems to brittle to count on. I suspect the team will be quite active in this area. So, that’s a pretty solid looking bullpen if two guys in particular are healthy: Kelley and Glover. Our entire strategy in the off-season seems to hinge on the health of these two. I have no guesses; so lets assume one of them is good and one of them has a significant all of 2018 injury. That means we probably pursue another Matt Albers type in the off-season. Meanwhile, there’s a difference of opinion on the value of both our current lefties: Romero’s ancillary numbers were barely adequate and lefties hit him for nearly a .300 BAA, so he’s not exactly an effective lefty. Solis blew up this season, posting a seasonal ERA of nearly 6.00 (his FIP was much better) and getting demoted at one point. But he gets lefties out, Baker trusts him, and I can’t see him not being a part of the solution. If the team thought they could improve upon Romero, perhaps they also pursue a lefty reliever (or resign the swashbuckler Perez). I’m ok with Grace as a long man (though his K/9 rates leave something to be desired) but I’d also like to see the team convert Cole to relief at this point. There’s some options issues to consider; Solis, Romero, Cole, and Grace are all out of options for next year, so they all either make the team or get cut loose. Cattle call for bench bats next spring. Am I missing anything? Lots of talking points here. Game 1: NYY@Houston: Tanaka vs Keuchel. Both guys were solid in their ALDS appearances, may be a run prevention effort. Game 2: NYY@Houston: Severino vs Verlander: Verlander has been great since moving over, but Severino was no slouch in his ALDS start. Game 3: Houston@NYY: Peacock vs Sabathia: Sabathia’s career renaissance continues; he was dominant in the ALDS. Peacock is an enigma; advantage NYY here. Game 4: Houston@NYY: Morton vs Gray: you’d have to say advantage NYY here; Morton struggled, as did Gray, but Gray’s ceiling is higher. I like Houston in 6 here. I think they win first two games at home, get one game in NYY then win game 6 behind Verlander. Game 1: Chicago@LA: Quintana vs Kershaw: Kershaw should dominate … of course his post-season stats are awful, but Lackey is Chicago’s 5th starter for a reason. Game 2: Chicago@LA: Lester vs Hill: tough match-up of lefties; if Chicago were to steal a game, it’d happen here. But Hill puts several big Chicago bats into neutral, and if he’s on he’s nearly unhittable. Game 3: LA@Chicago: Hendricks vs Darvish: I don’t see Hendricks taming the Chicago bats, fired up for their first home games of the NLCS. Game 4: LA@Chicago: Arrieta vs Wood: Is Arrieta healthy? who knows. I think LA gets to him and steals this game. The Cubs had to empty the bullpen to get through the NLDS. And i’m not entirely sure Wood is the LA 4th starter; it could be Kenta Maeda, who threw two relief innings in the NLDS. I also like LA in 6 here, maybe even 5. I could see LA winning both LA games, then dropping game 3, getting to Arrieta in game 4 and then having Kershaw shut them down in game 5. And as we saw in the Washington series … the Chicago bullpen getting from the starter to the closer is … suspect. Predictions: Houston in 6, LA in 5. It was a tough watch, to stay up til nearly 1am watching the inevitable. And it seemed inevitable to watch this team fritter away another NLDS clinching win through another wild outing from Gio Gonzalez to a rather inexplicable “failed starter giving relief innings attempt” from Max Scherzer. That was the shocking part to me honestly; how does he give up 4 runs? Just like in 2012 and in 2016, reliable bullpen guys leaked runs to either cut into hard-earned leads or to drip drip and put the game just slightly out of reach in the end. The Nats drop a series to Chicago where they hit better (both teams were god-awful at the plate but the Nats only slightly more so), where their team ERA was a full point better than Chicagos, and where they outscored the Cubs 20-17 over five games. Just as in 2016 when the Nats similarly outscored the Dodgers but dropped the series 3-2. It was tough watching Ryan Zimmerman flail at a very tough slider from Wade Davis to end the 7th with runners in scoring position. It was ridiculous to watch the umpires call Jose Lobaton out despite zero “conclusive evidence” that showed that the tag stayed on, killing a rally that looked like it was about to turn the tide of the game. And it was pretty tough watching both Werth and Harper get punched out by the same uber-reliever Davis to end the game. All in all, the Nationals batters left an astounding NINETEEN runners on base in this game. Nineteen. I guess they left their “clutch” pants at home. Baseball Playoffs rarely distill down the “right” champion. In fact, the team that had the best regular season record has subsequently won the World Series just five times since 1990 (the 1998 Yankees super team, the dominant 2007 Boston team, the 2009 A-Rod Yankees team, again with the 2013 Boston team and last year’s Chicago Cubs). The other 22 champions during that time were not the best teams in their leagues and in some cases weren’t even the best teams in their divisions. Miami famously has two WS wins but zero divisional titles in their history, which seems kind of ridiculous. I’m not saying the Nats were necessarily “better” than the Cubs … they were separated by 4 wins over 162 games, but they deserved to win this series. End of the line for Werth most likely, also for a handful of bit players, but the core of this team gets another shot at it next year. Shout out to Michael A. Taylor, who may have shared series MVP honors with Strasburg for his exploits in this series (he drove in 8 of the 20 runs we scored in five games). Between his renaissance this season at the plate and his exploits this series, it has me rethinking what to do with him for next season: I was pro-trade of Taylor and going with FA/Eaton/Harper outfield … but now i’m thinking you put some combination of Eaton/Taylor/Harper in that OF and save your cash for a 5th starter and/or more bullpen help. But we’ll get into off-season moves later on in depth. As for the rest of the offense, tts telling that the only other guys on this team who drove in runs were the “key men” in the lineup: Harper, Rendon, Murphy, Zimmerman. So our key guys struggled at the plate but still drove in the runs to keep it close. Turner finishes off a disappointing season with a disappointing series … lets hope an off-season of rest gets him back to his late 2015 days for next year. One last series stat. Strasburg’s line: 14 innings, 6 hits, 3 walks, 22 punch-outs, a 0.00 ERA … and a 1-1 record. He took a loss for his efforts in game 1. Bully for him for taking his game 4 start and shoving it down every pundit’s throat who questioned him. He really turned the narrative on his career with this performance … do you believe there’s still people out there who don’t think he’s an “Ace” in this league? Maybe that nonsense will end, given his dominance down the stretch and in this series. Next up for me; i’ll do playoff predictions I guess, because i like looking at pitching match-ups and guessing who might win. Quick predictions: Houston beats over-their-depth Yankees, LA crushes the exhausted Cubs, and LA fulfils their destiny by holding the Houston bats at bay in the WS. But we’ll dig deeper into it later. See you 2016. Another playoff opportunity lost for this team. Nats salvage the split; how’s our chances of getting back to DC for a 5th game? It was looking pretty gloomy heading into the 8th inning. Trea Turner had just struck out for the 8th straight time (ok that was an exaggeration, but he is 0-8 with four punch-outs from the lead-off spot this series) with the bases loaded and the Nats had gone 17 innings and scored precisely one lucky run (Anthony Rendon‘s excuse-me-opposite field homer). Then Carl Edwards Jr. hung a curve-ball to one of baseball’s best sluggers. And I mean, he frigging hung it. 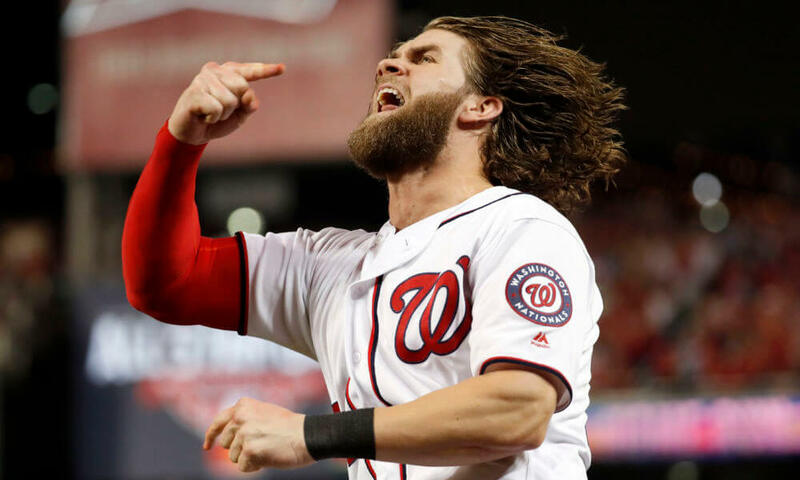 It came up to the plate on a big ole loop and Bryce Harper, who has been hitting majestic homers to the upper deck in RF since he was in his teens, did not miss. Tie Game, and the curious bullpen usage of the 8th inning by Joe Maddon continued a few more batters, enabling Ryan Zimmerman to hit one *just out* of left field off a lefty reliever to cap off a 5 run 8th inning come back and seal the victory. (Note, per comments, yes this definitely cracks my all time top 10 games list … we’ll publish it again in the off-season. I think i’ve got it 8th or so). Game 3: Max Scherzer vs Jose Quintana: Scherzer is (hopefully) healed from his hamstring issue, and hopefully can get the Nats the win they need him to get. Meanwhile, lefty Quintana has been decent for the Cubs since his acquisition, posting a 3.74 ERA for the team (which, ironically, is exactly the same ERA as Max’s career post-season ERA). Not one current National has ever batted against him, so I’d expect some struggles at the plate from our team, especially our big lefties. But, we also have some important RH batters who should benefit from facing a lefty starter who doesn’t have as good of stuff as Jon Lester has. Advantage Nats. Game 4: Tanner Roark vs Jake Arrieta: Arrieta’s 2nd half was awesome (he went 7-2 with a 1.29 ERA in the season’s last two months), but he also suffered a Hamstring issue that pushed his start back. He hasn’t pitched since 9/26; how rusty will he be? Roark got bombed in his last start (9/27), then struggled in a mop-up inning to keep him fresh (3 hits and a walk), and is a creature of habit in terms of preparation … so how will he look on October 10th after not having started for 2 weeks? I suspect this game could get to the bullpens early on both sides. Advantage Cubs though for the obvious reasons: they’re throwing a former Cy Young winner and we’re not. Game 5 if we get here: Strasburg against Hendricks again. We feel confident Strasburg will continue his reign of dominance … but can the Nats figure out how to be more patient against the soft-tossing Hendricks? Lets not get ahead of ourselves here; we need to get the split in Chicago before we talk about Game 5. When we get there, we’ll talk again. Bright Spots for the Nats so far: Strasburg, the bullpen, Adam Lind‘s game changing pinch hit in his first post season AB. Even Gonzalez‘s start wasn’t that bad. Areas of Concern: The offense in general; the team is hitting just .136 and is lucky to have gotten the split. Turner is the biggest concern; Werth is 0-fer but is putting the ball in play, and Rendon’s paltry BA takes some of the context out of the harder hit balls he’s hitting; they’ll fall eventually. After two posts (here and here) and multiple discussions about the edges of the roster, the team announced its NLDS roster. Here’s who made it and who didn’t. SPs: Strasburg, Gonzalez, Scherzer, Roark. We don’t know what order it’ll go, but we do know Stras goes tonight. I’m guessing it goes Gio then Scherzer to give him a bit more time. So, no Kelley (which we knew when he got bumped to the 60-day D/L), but more interestingly no Edwin Jackson or Matt Grace, his two best long-man options. And contrary to typical playoff construction, he’s using the 5th starter spot not on another arm, but on a bench bat. Perhaps their thought process is, if Scherzer can’t go they’ll get an injury replacement? So, they resisted the temptation to take Severino over Lobaton, or to give Drew a spot. But interestingly they are going to carry Goodwin, who hasn’t played in weeks really. And we get Robles. And we do not have de Aza, which many were worried about. So this is a pretty solid selection all things considered. Now that we know that the Yankees battered the surprising Twins, and that the Diamondbacks outlasted the Rockies, lets do a quick prediction piece. First; a quick look back. I did the obligatory seasonal prediction piece in early April 2017; how did I do? NL Central: Predicted Cubs by a fair margin, actual Cubs by “just” 6 games and it was close all year. NL West: Predicted Dodgers “by a hair,” actual Dodgers by a mile even though both WCs came from the NL West. NL Wild Cards: Predicted SF and NY, actual Arizona and Colorado. Wow, could not have been further off here. SF finished tied for the worst record in the game, and NY wasn’t far off. AL Central: Predicted Cleveland by a lot, actual was exactly Cleveland by a lot (17 games to be exact). AL West: Predicted Houston, actual Houston. AL Wild Cards: Predicted Toronto and Texas, actual was NY Yankees and the surprising Twins. So that’s interesting: I got all six divisional winners right, and whiffed on all four wild cards. Maybe that’s the way modern baseball goes; thanks to rebuilding efforts its easier than ever to pick the divisional winners, but the two wild cards open up post-season baseball to a significant portion of the league. NLDS: Nats over Cubs in five. Nats should have enough to beat the Cubs if Scherzer is healthy. NLDS: Dodgers over Arizona in five as well. The Dodgers have their hands full and missing Arrieta a second time may be the difference maker. I know Arizona gave LA fits in the regular season … but they’ll be more focused now. ALDS; Houston over Boston in four: I think Houston just has too much firepower for Boston’s pitching staff, which is pretty thin past Sale. ALDS: Cleveland over the Yankees in three; Cleveland whacked them in the seasonal series and should continue to romp. NLCS: Dodgers over Nats in seven. Seasonal series was 4-3, no reason not to think a NLCS would be the same. I just don’t think the Nats will have enough to overcome the balanced Dodgers attack. Maybe if the Nats had a guaranteed 100% healthy Harper i’d change my tune. I hope i’m wrong. ALCS: Cleveland over Houston in six. Cleveland is just too good of a team and their pitching will overcome Houston’s. WS: Dodgers over Cleveland in six. Another heartbreak for Cleveland, but the Dodgers’ talent wins out with the help of home field advantage and two Kershaw starts. Lets bang out a mailbag, this time with WP beat reporter Chelsea Janes at the WP. I’ll do a Playoffs prediction piece once tonight’s WC game is settled; no point in speculating until we know who the Dodgers are facing. Q: Is any contract extension for Dusty contingent on getting the team past the first round? A: I wouldn’t think so, honestly. I think Dusty Baker has done an excellent job with this team, turning it around starkly from the Matt Williams regime. Yes its curious that he hasn’t been extended … but then again, the inevitable extension for Mike Rizzo seemed to be a little late coming too. Maybe this team has told him privately that they’ll get it done this off-season and just focus on winning for the time being. Janes has reported several times that everyone plans on Baker being back, that Rizzo wanted to do it in ST but ownership did not, and that’s the Nationals MO. 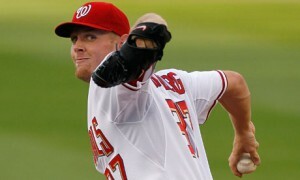 Q: Is Stephen Strasburg going to start Game 1? A: As of the point of this writing, it definitely seems like it. This gives Max Scherzer one more day to recover, and gives the team the choice of selecting either guy for Game 5 thanks to multiple off-days in the playoff schedule. I’d be up for this scenario honestly; Scherzer may be the Ace but Strasburg has been the best pitcher in the last two months. Janes does not know but pointed out Strasburg’s unbelievable numbers since returning from the D/L in August. He definitely merits a 2-game NLDS if it comes to it. Q: Chances Anthony Rendon gets an extension this off season? A: Hmm. Good question. Rendon is going to be due a sizeable arbitration raise this off-season and still has another Arb year, so I could see the team doing a 2-year deal now to avoid the arguing. Perhaps 2yrs/$25M or something (with salaries of $10 and $15M?). I’d take that for cost certainty for a guy who doesn’t get near the credit he’s due but is putting up MVP numbers. As far as longer-term extension? I dunno; is Rendon a lifer in Washington? What will it take to sign him long term? In this respect, his under-ratedness works to the team’s benefit. I see him kind of in the Adrian Beltre mold; good defensive player, not as flashy, solid offensive contributions. Beltre is getting $18M per right now and just finished a 5yr/$80M deal before that, so that’s a good benchmark. Maybe Rendon can be had for something like a 5yr/$90M deal which would take him through his age-32 year, so we’d get his best years but he’d get another shot at the FA market at 32. Janes agrees with my assertion that they’ll likely buy out his Arb years, but notes that he’s a Scott Boras client and likely hits FA. Fair point. But our read on Rendon is not the hyper-aggressive big character/ego guy, so maybe in the asme vein as Strasburg (also Boras client) he’ll sign an extension to stay comfortable. He’s also a Houston guy born and bred (HS and college) and would make a ton of sense heading back there. Houston has a log-jam of good infielders right now … but a lot can change in a couple years. 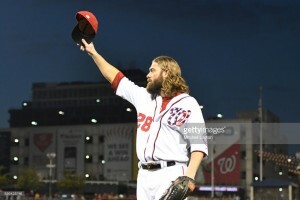 Q: Would you start Jayson Werth or Adam Lind in LF for playoffs Game 1? A: Werth absolutely. Especially since Jon Lester is likely to go Game 1. Maybe you could get more clever in games 2-4 when RHP starters go for Chicago… but I still doubt it. Unless Werth is hurt, he’s your starting LF. And if he was hurt … i’m not sure I’d go with Lind out there in lieu of Howie Kendrick honestly, given the defensive liabilities. Janes agrees, thinks it would take an injury to get someone besides Werth out there, and points out that Werth was a rock in the playoffs last year. Q: How worried should we be about the recent performances of Gio Gonzalez and Tanner Roark? A: Slightly worried, but not overly so. The Nats have really had so little to play for for weeks that its possible that these guys just mentally relaxed enough to have bad games, especially in the season finale (which was emotional for it being Werth’s likely final regular season game in a Nats uniform). Janes thinks Gio was a bit under the weather, and that Roark admitted to not being totally focused during the grind of the final week. Q: Will Victor Robles make the major league roster out of spring training in 2018? We still could buy ourselves a bigger bat to play LF and have these guys all jockeying to be the 4th OF. We still could see a trade in the off-season, flipping some of this sudden OF depth (along with Wilmer Difo) for the answer. Robles needs, in the same vein as Trea Turner, to have his service time managed a little bit. Now, I could be wrong, and the team could find itself in a dogfight early in Harper’s last season. They could get hit with injuries again and he’d be right back up. But to start, i’d have him in AAA. Janes repeats practically everything I wrote. Q: Who will be the last man on the bench? What will the bullpen look like? Will Robles make the playoff roster? A: I think …. if it were me i’d put Robles on the roster. But Mr, Baker probably wants a more veteran player, so don’t be surprised if the kid is left off in lieu of some .200 hitting last man. We’ll see. We talked about this in the last post so we won’t do it again, and Janes posted a whole 2,000 word article on it … so we’ll defer to those discussions. How do we stack up against Chicago for the NLDS? Warning: lots of judgments based on short sample sizes and possibly not taking into account other factors that may have been in play during 3- and 4-game series, which are in reality a small fraction of a season. And yes I know, past performance is no indicator of future performance. Just read and stop being a buzz-kill will ya? So, we’ve known for a while that we were going to face the Cubs in the NLDS. But now its official. So lets peek back at our two series against them this year to see how our guys matched up to see if there’s any places to keep an eye on. On a macro level, we took the season series from the Cubs 4-3, outscoring them 39-28 in the process. We split four games at home in June, then took 2 of 3 against them on the road in August. Max Scherzer went 6, gave up 2 hits and a run with a victory over Chicago at home in June. That sounds pretty good. Stephen Strasburg went 7, punched out 13 (!) and gave up 3 runs (2 earned) in a home victory in June. I’ll take that. Gio Gonzalez went 6, gave up just two hits (good) but walked 5 (bad) , managed to give up just one run (good) and was an unlucky loser in the June home series. Tanner Roark went 6+, gave up 2 runs on 5 hits and took a loss in Chicago in August. Not bad. The other three starts against the Cubs were Joe Ross in June, Edwin Jackson in August and Erick Fedde in August, so the Cubs have only seen our starters once each this year. So, all four of our starters basically had quality starts against the Cubs this year. That sounds promising. No red flags. We’ll ignore the fact that both Gio and Roark got bombed on the season’s closing day. Maybe they were hung over. Cubs Starters: How did Chicago’s presumed playoff rotation fare against us? Jon Lester went 6, gave up 3 hits and a run in a no-decision in the June finale. Tough. Lester threw another QS in August, going 6 2/3rds, giving up 3 runs on 6 hits and getting a ND against Fedde. Not bad. Jake Arrieta was super-wild, walking 6 in 4 innings and taking the loss against Scherzer in June. Uncharacteristic performance. Kyle Hendricks went 7, giving up 3 runs on 5 hits and took a loss against Roark in the August series. About what you’d want out of a 3rd starter. Jose Quintana was a mid-season acquisition and did not pitch against us this year. The other starts against us were thrown by Eddie Butler (who hails from Chesapeake, went to power-house Greenbrier Christian and was a 1st rounder out of Radford a few years back) and Jon Lackey (twice). So, Lester was solid against us twice, Arrieta had an uncharacteristic struggle, and Hendricks was good but not dominant. Quintana has thrown to a 3.74 ERA in his 14 starts, good but not lights out. I have no idea how they’ll line up for the playoffs but think it may be as they’re listed above (maybe Quintana is #3 and Hendricks is #4). It does look like Lackey is odd-man out of the Chicago rotation, which should be a fun conversation with their manager. Summary: I like how our Starting Pitching lines up frankly; Scherzer is Scherzer, Strasburg has been unhittable for two months, and Gonzalez has been sneaky good all year. Gonzalez and Roark project to pitch in Chicago … but Gio’s away splits are pretty good this year (11-5 with a 3.12 ERA). Bryce Harper is 1-7 against Lester, 4-14 against Arrieta, 4-13 against Hendricks and has never faced Quintana. At least his one hit against Lester was a dong. Daniel Murphy is 4-14 against Lester, 6-19 against Arrieta, 4-15 against Hendricks and also has never faced Quintana. Better. Ryan Zimmerman is 2-16 against Lester, 5-21 against Arrieta, 0-9 against Hendricks and has also never faced Quintana. Might be a rough series for Zim. Trea Turner is 1-2 against Lester, 1-2 against Arrieta, and has never faced either Hendricks or Quintana. Not much to go on here. Jayson Werth is 2-4 against Lester, 2-9 against Arrieta, 0-3 against Hendricks and has never faced Quintana. About what you’d expect. Anthony Rendon is 1-5 against Lester, 4-11 against Arrieta, 2-11 against Hendricks and has never faced Quintana. Not bad. I didn’t bother looking up Wieters or Taylor numbers because I expect little from them this off-season; anything they contribute is gravy. Our 1-6 hitters need to make it happen. Kris Bryant is 1-10 against Max, 2-5 against Stras, 2-10 against Gio and a strong 5-11 against Roark. Might be an interesting series for the defending NL MVP. Anthony Rizzo is 3-10 against Max, 2-13 against Stras, 2-22 against Gio and 4-18 against Roark. Clearly the lefty and Roark’s swing-back fastball is effective against him. Willson Contreras has never faced Scherzer, is 1-3 against Strasburg, 1-2 against Gio, 1-3 against Roark. Almost no history go go on. Javier Baez is 0-5 vs Max, 0-6 against Stras, 0-6 against Gio and 1-3 against Roark. Not a lot of success here for Baez. Kyle Schwarber has just two ABs against any of our starters, going 1-2 in a game against Roark. I’m not entirely sure that Schwarber will play (he had 30 homers but an awful BA), nor Baez (since the Cubs have Ben Zobrist). But these are the key bats for the Cubs and there’s not a ton to go on. It seems like Bryant will be a handful, Rizzo may be an issue against some of our guys, and the rest of the squad could hit or miss (which, perhaps, is what you’d say also having not seen any of these stats). So how does it look overall? I like our chances, honestly. I don’t like how Harper has looked since his “return” so that’s a huge worry, but I like our chances with the Cubs having to beat Scherzer twice and Strasburg once in a short series, and I like Gio going against the power hitting lefties in Chicago’s lineup. I like our revamped bullpen, especially if we never have to depend on the 5th and 6th guy out of it. It comes down to this injury scare at this point; is Scherzer going to be ok? Can the Nats survive if Scherzer is out and we’re forced to give a playoff start to Jackson? Assuming Scherzer is ok, Nats in 5.